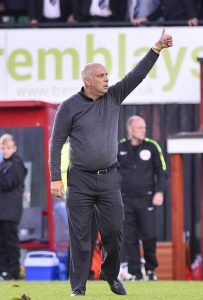 WOKING boss Garry Hill is accustomed to FA Cup first-round giant-killing acts – he’s been there, done that and got several t-shirts to prove it, writes Andy Fitzsimons. This time it’s different, as Hill will be hoping his side aren’t on the receiving end of an upset against lower-league Stockport County on Saturday (5 November). Unlike Woking – who needed two attempts to see off Torquay United in the fourth qualifying round – the Hatters have yet to concede a goal in their three previous FA Cup ties en route to the first round proper. And having already swept aide Hyde, Salford City and Bishop Auckland in the earlier qualifying rounds, Woking’s National League North hosts will fancy their chances of causing an upset on home soil. Despite the turbulence surrounding Woking’s plight this season, Hill (pictured left) still has good reason to remain quietly confident against Stockport. He knows that if his side can keep it together at the back, goals are likely to be on the cards at the other end. It’s not an empty promise either, as Woking have scored in 19 of their previous 20 league and cup games since August. That achievement is something that very few National League clubs have been able to muster so far this season. With £18,000 up for grabs for all first round winners – and the prospect of being drawn against the likes of Charlton Athletic, Bolton Wanderers or Bradford City in the next round – Woking will be hoping for a financial windfall if they can progress in the competition. The Cards have already improved on their recent cup exploits to reach the first round. Prior to this season, Hill’s men had reached the first round proper in only one of their last four attempts. That was in the season 2014/15 season when they lost 3-0 to Wrexham. 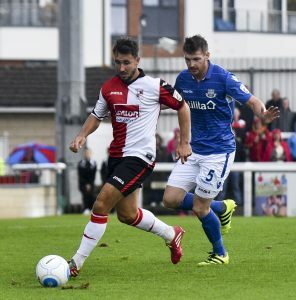 However, Woking will be without influential on-loan striker Matt Tubbs (pictured on the ball) this weekend, who returned to Forest Green Rovers this week.